Is power all you need to make your views prevail? The foreign Tibet scholar Elliot Sperling has commented: “There is nothing subtle about all this; China is quite determined to dominate the Tibetan historical view, whether or not coercion or even force [of arms] is necessary.” In the course of this loud and forceful rewriting of history, to which considerable human and material resources have been devoted, new phrases are often mingled with the old clichés. One of these new phrases — it’s become a buzzword — is ‘misreading.’ The term has come in handy for all the mouthpieces promoting [China's] soft power. Du Yongbin, of Beijing’s Tibetan Studies Center, recently wrote an article, “Western society has five big misreadings about Tibet,” on which the official media have lavished praise. As overweening as this may sound, they have the resources to back it up. It was learned recently that in pursuit of ‘discourse power’ the Chinese government has allotted to each of three mouthpieces (namely, Xinhua, People's Daily, and CCTV) the substantial sum of 15 billion RMB, ordering them to go forth and expand overseas with high-powered media work and realize the lovely dream that was articulated by Overseas Times. But wealth is not the same as the resonance of truth. A senior figure in the foreign press corps told me that not long ago an official from Xinhua privately approached him for advice, asking how to achieve discourse power in the West. He gave a brilliant answer: “In a word, positioning.” Then he explained, “You people are positioned as mouthpieces, so you can’t think about whether the news you report is true or not; and so you are incapable of establishing any power of discourse. We, on the other hand, are positioned to make money. In order to make money we’ve got to provide truthful reporting, and that’s a necessary condition for establishing authority in discourse.” When he heard this, the Xinhua official was very uncomfortable. Woeser wrote this article for the Tibetan−language service of Radio Free Asia. I have sometimes used phrases such as “To make one’s views prevail,” “to control the discussion,” “to establish authority in discourse” in order to elucidate the term huayu quan, ‘discourse power.’ The expression is akin to the military term for ‘air superiority’ (zhikong quan) and suggests a belief that the domain of human discourse is an arena to be dominated by the sufficient application of power. Woeser is, of course, rejecting that belief. 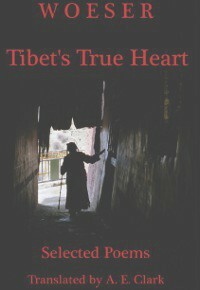 The article by Elliot Sperling which Woeser quotes appeared in the April 2009 issue of Far Eastern Economic Review under the title, “China digs in its heels in Tibet.” I have quoted from his original English, noting that in one place where he writes “force” she uses the Chinese word wuli, ‘force of arms’ (military force). The Overseas Times (Qiao Bao) is an online Chinese-language newspaper with a readership of overseas Chinese. 15 billion RMB: for a total of 45 billion RMB, approximately USD 7 billion. Copyright © 2009 Ragged Banner Press. Best viewed with Mozilla Firefox.